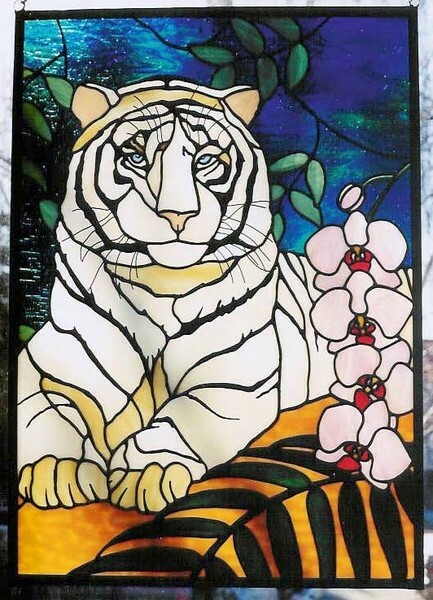 When we saw this tiger design in the Winter 2000 Edition of Glass Patterns Quarterly we knew that we had to make it. This was the first large panel we made and the panel measures 20 x 28 inches. We used a darker background which makes this Bengal Tiger appear more menacing. No matter how large the room is he is always looking at you. With the use of protruding wire whiskers and foil overlay stripes makes him appear very real. He has been featured on several websites in Canada and the USA and hangs in our living room. A truly one of a kind piece of stained glass that we have enjoyed everyday for many years.